You save £10.00 that's 43% off! Integral Filament Omni GLS Lamps utilise Filament LED technology to create a decorative look and wide beam angle that looks fantastic in ceiling pendants and fittings where the lamp is exposed. 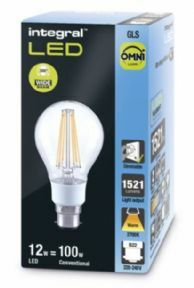 These retrofit dimmable lamps are highly efficient and are an ideal replacement for traditional tungsten filament bulbs.